Characters: 3 My favorite part of reading this book was learning more about Indian culture, something I wasn't super familiar with before. 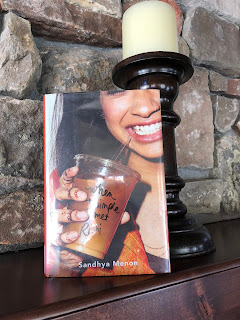 It was very interesting to experience some of the aspects of growing up in both an Indian and an immigrant household, and how immigrants children have all kinds of different views about what it means to both be Indian and American as shown by Dimple and Rishi's clashing views. Aside from that, though, I had a hard time with any of these characters. I just don't think the author really let us get to know any of the characters enough to feel invested in them. Rishi was the nice guy who wants to do right by everyone, Dimple is driven by being different and looked down on by other people in her field, and every other character is just a snobby rich kid. While they all had interest on the surface, the book didn't let the reader inside enough. Plot: 3 Another major problem with this book is that there are no real problems. There are issues that seem like they could be problamatic, but they all magically work themselves out. At a certain point, the reader starts to lose interest in whatever the current issue is because the past has set the president that there really are no stakes. Also, for the book being centered around a tech camp with a very strongly STEM based main character, there is almost no discussion of the camp, the classes, or anything that goes into building an app. All of these were things I'd been expecting or looking forward to with this book. Writing: 3 I'm not sure why Menon chose a third person limited-duel narrative format for this book. I think that the duel narrative idea was good and would have greatly improved the distance issue with the characters had it been done in first person. The issue here was that by labeling different sections randomly "Dimple" and "Rishi" without distinctly changing the narrative voice, it just highlighted how little of the character the reader gets to experience.